AUV-6 series spectrophotometers equipped with 6” LCD display, is an ideal and advanced analytical instrument for laboratory to realize wavelength scanning, kinetics test, multi wavelength functions. All functions can be operated on spectrophoto-meter and can be read directly on the display. Details : AUV-6 uses a rigid 8mm die-case aluminum base as its optical mount to ensure instrument stability and reliability. 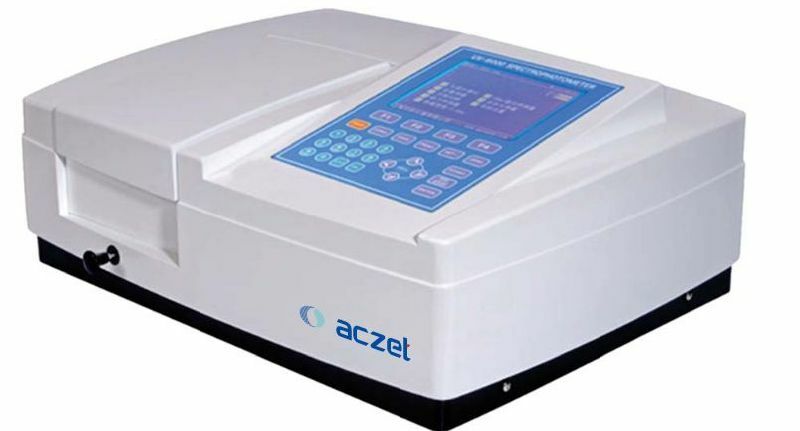 Powerful functions : Multi functions like spectrum scanning, standard curve, kinetics, multi wavelength, DNA/Protein testing can be operated directly on the spectrophotometer and all corresponding curves and data can be displayed directly. Date output : UV-6 is equipped with USB port to connect with a PC to display spectrum scanning, kinetics and multi wavelength testing results on the screen. The software is optional.